It looks like Matthew is ready to rock for 2015! He has 40 of his F18A's ready to go! If you don't already have a super clear & crisp VGA picture, and you're not exploiting the 80 column capabilities of some programs or even playing some of the Rasmus games in enhanced graphics mode... maybe this is the time to upgrade? *Disclaimer: I have no financial interest in this product or any business affiliation with the manufacturer/seller of this product, I just hate the thought of TI'ers suffering with old crappy video. Has anyone tried the F18A version of BOOT? Does it present multiple menus on the screen or just one. Toggling BOOT (the original) into 80-column mode simply displays a single menu with smaller characters in the middle of the screen - a complete waste. I came across this interesting screen today... Now I have ZERO knowledge of the Geneve 9640, so I have no clue if this program will only work under MDOS, or if it's a stand alone program that requires an 80 column card. It does not quite look like 80 columns, but it's sure more than 40! I wonder, if this program can work on a lowly TI with an F18A? I've never seen it before. 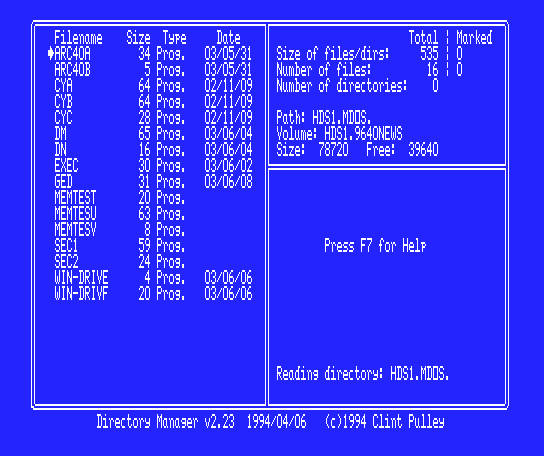 That's a pure MDOS program called Directory Manager. It was part of a nice set of tools Clint Pulley wrote for MDOS. I believe he included the source code with the distribution. It was written using the MDOS version of the small c compiler. Clint did make use of some Geneve OS services though much of his code looks to be compatible syntax-wise with C99. A C expert would need to assess overall viability and would need to strip out the Geneve-specific routines specific to the OS command line interpreter and multitasking/task loading. I ran that statement through a translation routine.. The result is: "DAMN GOOD PROGRAM"
Yes, it's a better file management program than anything written for the TI. TI file managers seem to run in slow motion after getting used to Directory Manager. Do you think this one is even remotely transportable to the TI with some bummed and altered code from MDOS or would this take a major re-write thus making it nearly impossible and not worth the effort? "Someday" ... I see the TI with it's own suite of 80 column utilities, either individual programs or in a DOS type setting or possibly even in a GUI environment. It'll happen! When? I dunno. The old versions of BOOT that have floating around in the wild for decades have an 80 column bug that was overlooked by previous 80 column cards. This bug has been patched by Tursi. If you would like to run BOOT in 80 columns on your real TI-99/4A equipped with an F18A, please download the attached .ZIP file. Actually the version you posted IS an older version of BOOT. The date in the version is 10/16/89. The newest version, to the best of my knowledge, is dated 12/13/89. ...and the ability to load a CHARA1 file into BOOT to replace the character set. Edited by --- Ω ---, Fri Aug 21, 2015 4:39 PM. Cool, I like it Schmitzi! Now I do not need to maintain that list any longer. yep. any info I can get will be entered. with the F18A-feature was another idea today, when I saw your list here. A small correction: Titanium does not have more sprites on the F18A, but it's running at almost double speed on the F18A. The reason is that Titanium is using the mode known as half-bitmap mode, which is similar to bitmap mode regarding the colors, but similar to ordinary graphics mode in the way that the same 256 patterns occupies the full screen. On the 9918A no more than 8 sprites can be displayed in half-bitmap mode - if you add more sprites they will have ghost image doubles flying around in a yet undescribed pattern. So Titanium cannot use half-bitmap mode on the 9918A, but is instead using what I call 2/3 bitmap mode. This mode is free from sprite issues, but requires double the amount of VDP RAM compared to half-bitmap mode, and this is why Titanium is running at half speed on the 9918A. The F18A does not have problems with sprites in half-bitmap mode, so here the program can run at full speed. ... so here the program can run at full speed. Thank you for the clarification. I changed the post. I would say no. My reasoning is that just because something is 80 column, does not mean it will run on the F18A. The original list was to let people know what 80 column programs ARE specifically compatible with the F18A. With the 80 column Multiplan hack that works with the F18A, I'm curious, has anyone ever dumped the Multiplan GROMS? Can you imagine a 80 column cartridge with all the goodies like a Multiplan-80 an EA-Complete-80 and anything else F18A that you wanted to stick in the ROM side of the UberCart. I'm not sure I understand what you're asking for, but you should be able to extract (unzip) the GROMs from the RPK file. And my 80col-list/PDF is a byproduct only, generated with the infos I have stolen here or so. Nothing of this is given in a PDF. Damn... and I thought I found the perfect excuse to abandon it!